Yes, we're spending the New Year in Bangkok. We've had a stressful year and haven't really had a chance to travel anywhere together in a long while. We'll walk the city, eat and drink, and read by the hotel pool. I won't even bring my computer, just the N7 tablet, so I'll be mostly offline. Instead I bring "素数夜曲，女王陛下のLISP" ("Prime Number Serenade, Her Majesty LISP"), an 800+ page popular introduction to number theory and functional programming. Think Gödel, Escher, Bach, but for prime numbers and Scheme. And in Japanese. I'm on page 15 so far; it should keep me occupied for a while. We leave shortly after midnight tonight, and we'll be back early next year. Meanwhile, have a good winter holiday everybody! Tom Yam Kung soup as made by Ritsuko's cousin Ide-san. That's all the Thai-themed pictures I have so far. 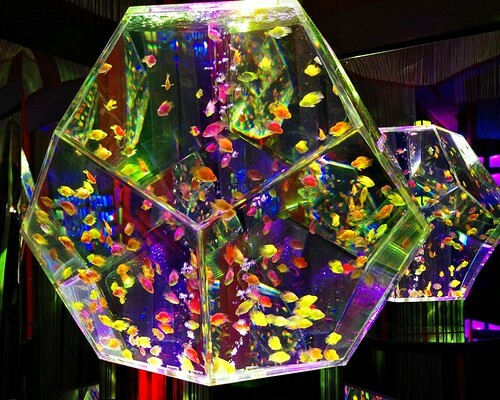 We went to see an Art Aquarium exhibition at Daimaru North in Shinsaibashi over the weekend. 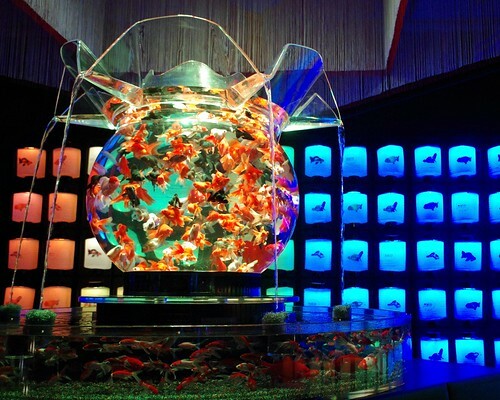 It's a live exhibition of goldfish breeds and creative aquarium designs. It may sound a bit pedestrian, but it was really cool — and really popular; there was a line to get inside, and the place was jammed with people. Photography is explicitly allowed as long as you don't use flash or a tripod. Turns out, though, that it's quite difficult; it's very dark, and all aquariums are lit by constantly shifting coloured lights, so exposure becomes pure guesswork. 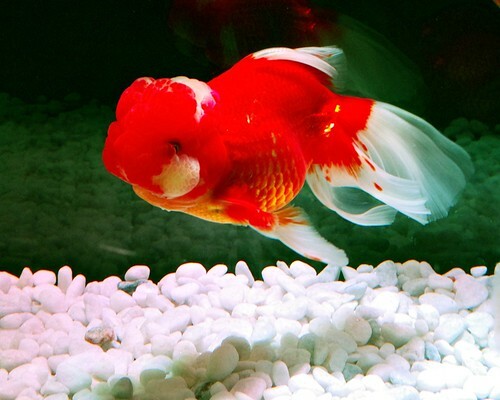 There were several types of goldfish on exhibition, many with rather bizarre appearances. Turns out this is a thing; people breed them for specific colours and shapes as a hobby, just like we do with dogs. Puppy-eyes. 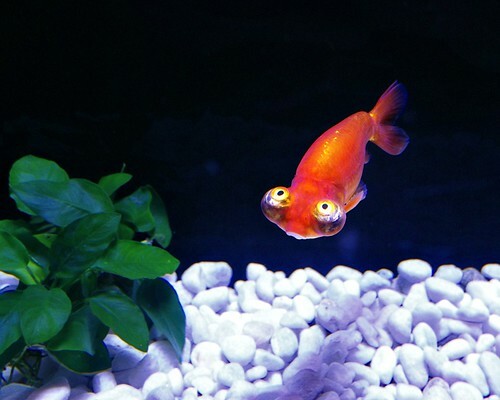 I believe upturned eyes aren't that rare among shallow-water fish, so it's perhaps no surprise that goldfish can be bred to have them too. 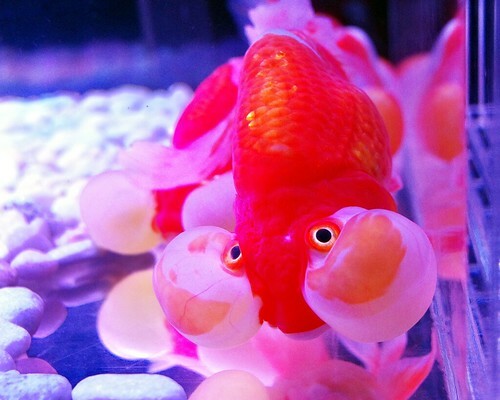 Many breeds had this kind of large puffy folds around the eyes. 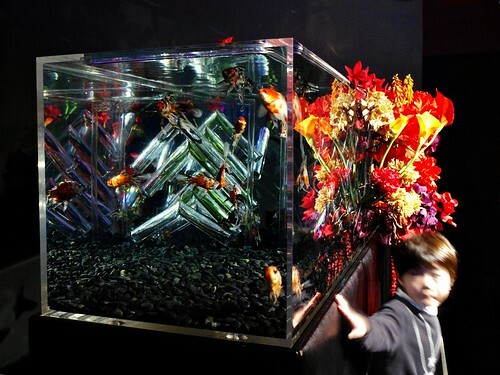 The art aquariums are surprisingly cool; installations rather than static objects, with pulsing lights and loud music. Not something you'd keep at home or anything, but a fun experience to see. The exhibition runs until end of January, so if you're in Osaka it's well worth taking a look. Oiran. About a thousand fish in total, and apparently inspired by Edo-era red-light districts. Which, believe it or not, doesn't seem so far-fetched once you read the artists' explanation. Ikebana aquarium. The flower-pot 'tubes' stick right into the aquarium. If you're in Osaka over the New Year and looking for something to do then this is worth a visit. Just be prepared for plenty of other people with the same idea. Merry Christmas! 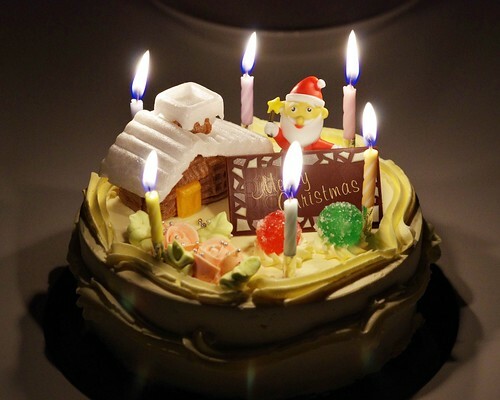 We got ourselves a Christmas cake again this year; it's the same kind as last year so if you feel you've seen this picture before then you're not far off. 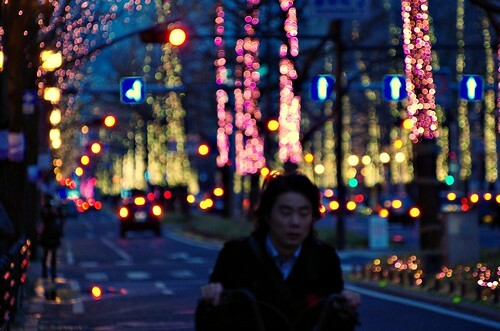 Midōsuji is lit up for the winter holidays. The weather is not very cooperative this year though. So, another election rolls around. The DPJ got trounced - deservedly so - while the old LDP and New Komeito managed a supermajority. Hashimoto and Ishiharas Japan restoration Party did not do well, placing just behind DPJ in number of seats. It's LDP and Abes turn to make a muddled hash of everything. Ho hum, meet the new boss same as the old boss. The real news is the election numbers. Japan has a first-past-the-post voting system. This means the number of seats and percentage of the vote is often badly correlated. And this was blindingly clear this time around. The LDP got 28% of votes this time, almost exactly the same as their disaster election in 2009. And yet, they go from 119 seats to 294. The DPJ collapse, on the other hand, is due to a real, significant drop in support, mostly in favour of Ishiraha and Hashimoto. There's more to this. 28% percent support from voters is very low, and not any kind of mandate. But participation in the election was less than 60%, the lowest ever. The incoming government thus has the explicit support from all of 17% of the eligible voters. The LDP has clearly never managed to bounce back from their crash of past years. I would expect less stability going forward, not less, as the government gets torn between making use of their supermajority for their pet issues on one hand, and winning over the large majority of voters that never supported them on the other. But such low support numbers for an incoming government spell trouble not just for the LDP, but for the entire political process in the long term. We have a party that manages not justto form a government but form a supermajority with a minor coalition partner on the back of less than one fifth of the votes. This time the beneficiary is the bumbling, slow, mostly harmless LDP, which likely means little of practical importance will come of it. But a populist, far-right xenophobic party could well capitalise on the same political weakness. It would be completely unthinkable for a fascist party to get anywhere near half the votes here in Japan. It would not be inconceivable for a well-run campaign with the right issues to pick up a 15% protest vote. And in today's system, the right 15% could translate into forming the Japanese government. That possibility worries me. 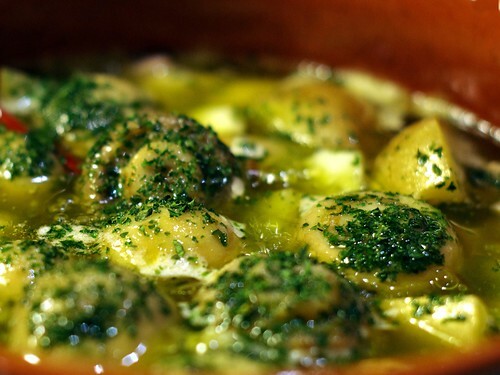 "Champiñones al ajillo", Mushrooms with garlic, is a great Spanish dish. It's really easy: You need champinion mushrooms, a cooked potato with skin, three or four cloves of garlic, two dried chilies, fresh or dried parsley and an enormous amount of olive oil. If you want you can also use bits of cooked chicken, shrimp and other stuff. Mushrooms and potato in olive oil. Clean the mushrooms, and cut the potato into bite-sized pieces. Slice the garlic cloves lengthwise and remove the center stalk. Remove the chili seeds (or not, if you want it a bit hot). 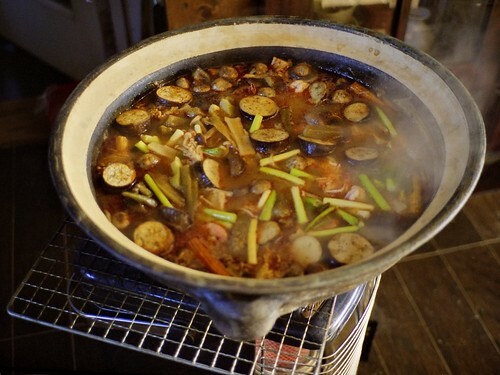 Put all ingredients in a small pan or (as here) in an earthenware pot. Everything should barely fit in the bottom. Pour in enough olive oil to almost cover — that is a lot of olive oil, believe me. Don't panic. Put the pot on a burner and let everything cook for, oh, fifteen minutes or so. Add plenty of salt and pepper towards the end and finish with parsley. Bring the pot to the table and eat as a main or side dish, with white bread to soak up the oil. Now, there's a lot more oil than you really want to eat at once, so save the leftover oil in the fridge. It's full of flavour and makes a good base for a pasta sauce. It'll keep for days at least, probably longer, so no need to hurry. My current favourite pasta with this oil (sorry, no picture) is simple: Cook some spaghetti. Soak a bunch of dried tomatoes in hot water for a while, and cut into largish pieces if needed. Take a boiled potato (yes, I like the potato-oil combination) and cut into pieces. Heat the oil in a skillet, add the tomato and potato and cook them until they just start to change colour a little. The oil is flavoured already so no need to add anything else. Once the pasta is almost done, mix it in with a little of the cooking water and let it cook in the sauce for a little while. Salt and pepper to taste. Two delicious dinners in one, with minimal effort and great results. So, the Japanese Language Proficiency Test has once again come and gone. Subjectively a bit easier than last year, I think, but I doubt I'll have passed anyhow. Grammar isn't my strong suit. In fact, if grammar was a suit, I'd be naked1. A bit of extra stress this year, as I need to be in Tokyo from Monday morning for a three-day international symposium2. So I came home after the test only to pick up my bag, then head back out to Shin-Osaka station and the Tokaido shinkansen. Three days is a fair amount of time away from work and from Ritsuko. The event is held at Tokyo International Forum, which will hopefully have decent wifi, so at least I'll be able to keep in touch and perhaps also get a bit of work done during less relevant presentations. #1 Yes I know; 'suit' refers to a suit of cards. But that doesn't make for a silly joke. #2 What's the difference between a symposium and a conference? None, today, but symposium sounds more academic. To me it also suggests a smaller event, with a higher proportion of speakers to attendees.